Everyone knows seventeen-year-old Grace Foley is a bit mad. She's a prankster and a risk-taker, and she's not afraid of anything—except losing. As part of the long-running feud between two local schools in Swanston, Grace accepts a challenge to walk the pipe. That night she experiences something she can't explain. The funny girl isn't laughing anymore. She's haunted by voices and visions—but nobody believes a girl who cries wolf. As she’s drawn deeper into a twenty-year-old mystery surrounding missing girl Hannah Holt, the thin veil between this world and the next begins to slip. She can no longer tell what's real or imagined—all she knows is the ghosts of Swanston, including that of her own mother, are restless. It seems one of them has granted her an extraordinary gift at a terrible price. I trace the word with my finger. It shimmers. A sharp impact near my ribs knocks me sideways and the pipe seems to buckle and twist. My legs lose grip. Close by, someone is sobbing as if their heart could break. Vikki Wakefield’s first YA novel, All I Ever Wanted, won the 2012 Adelaide Festival Literary Award for YA Fiction, as did her second novel, Friday Brown, in 2014. Friday Brown was also an Honour Book at the Children’s Book Council of Australia, in 2013, and was shortlisted for the prestigious Prime Minister’s Awards. Vikki’s third novel, Inbetween Days, was Highly Commended in the 2016 Barbara Jefferis Award, was a 2016 CBCA Honour Book and was shortlisted for the 2016 Prime Minister's Awards. Vikki lives in the Adelaide foothills with her family. Ballad for a Mad Girl is a ghost thriller with a literary angle. An action-packed page turner about survival and the different ways we deal with grief. 5.0 out of 5 starsThe tale Grace has to tell is deliciously dark and spine tingling. I felt a connection to the protagonist, Grace almost immediately. You only make to the third page before she tells you of her mother’s death. Grace’s hides her grief and dark inner thoughts from everyone around her, behind the shield of being her school’s resident joker and daredevil. This is a brilliant bloody book. The tale Grace has to tell is deliciously dark and spine tingling. The story’s pace and flow are fantastic. A thrilling murder mystery with some seriously creepy scenes. The story explores grief, belief in the paranormal, relationships with family and friendships, mental illness and criminal redemption. 5/5 a #LoveOzYA must read. Vikki Wakefield is one of the most creative and daring authors writing for young adults today. 'Ballad for a Mad Girl' is an Aussie YA Gothic tale that smartly uses the supernatural to explore the depths of grief and growing up, and the pain to be found in both. This is a caring and keening novel, creepy but tender and wholly marvellous. 5.0 out of 5 starsRecommended. 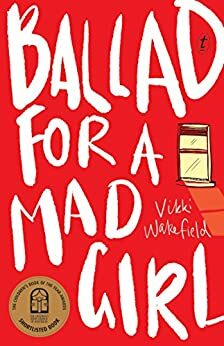 Ballad For A Mad Girl is the fourth novel by Australian author, Vikki Wakefield. Seventeen-year-old Grace Foley’s dad has grounded her (again) for a stupid prank (and yeah, she probably deserved it). But tonight, there’s a pipe challenge on: all her friends will be there; her daredevil reputation and her record are at stake; she’s got to show those Sacred Heart kids who’s the champion, so of course she’s going to sneak out. But at the quarry, when she’s on the pipe running across the gully, something strange happens. She freezes, and later doesn’t even remember how she got off the pipe. Twenty-three years ago, seventeen-year-old Hannah Holt went missing, and the gully is where locals believe that William Dean put her body. The gully is where, a year later, he jumped to his death, many say from guilt. Maybe there are ghosts there, and maybe they’re haunting Grace, because now, everything in her life has gotten weird: Diesel the dog is acting spooked around her; she’s seeing strange things in corners; she drew something in art class she just can’t explain; the TV and the clock radio are acting up; and something’s not right with the friends she’s had since third class (although maybe that’s not so recent). What a great tale Wakefield gives the reader. An original plot with a twist or two and a good dose of the paranormal to keep it interesting. Wakefield’s characters are quirky but credible, their dialogue is authentic, and she perfectly captures the feel of a small town. As Grace and her friends deal with growing up while trying to remain loyal to each other, they encounter all the usual adolescent afflictions including raging hormones and peer pressure, but also grief. Domestic violence also features. This is a brilliant coming-of-age tale that will certainly have wider appeal than the Young Adult genre in which it sits. Recommended. I loved this book. It was amazing, and I think I've only said that about one other first-person narrative book. This book HAD to be written in first-person POV. Her thoughts, her feelings, her actions - they were so real! I felt them myself! And just when you think she's lost it or dies or been healed... Well, spoilers and all that. Gripping. Just beautiful. I couldn't put it down. It is really amazing the power of a good cover and title. The only thing that I really knew when I first found Ballad of a Mad Girl was the way the title looked. Despite the book being over three hundred pages, I read it in a single evening and now I will certainly be taking note of Vikki Wakefield’s work. This book was amazing, a near masterpiece. For all my reviews I attempt to explain what I liked and didn’t like and why so that you can decide if it is right for you. Please feel free to leave comments or message me, I am always happy to talk about reviews or the books themselves. Who is Vikki Wakefield? Well this is my first foray into her so I decided to take a moment to read her biography. I always read about the author of a book before reading it to get a feel for them. There are a lot of benefits to doing this, but one reason is prejudices thrown into a book is not generally my taste so I try to avoid it. Vikki’s bio doesn’t tell me a whole lot about her feelings and preferences except that she seemed to have a lack of creative outlet in her first life in the daily grind. She talks about her past work in accounting and journalism and how she’s adventurous and frankly sounds like a lot of fun to hang out with. While I may not have a sense on how she feels about big issues, I’m very glad that she decided to become a writer. One of the first things about reading books I’ve come to appreciate is the importance of design. This can the three act structure, or other foundational rules like following a guiding principal and keeping your story honest. In the case of a good book you won’t even notice these rules exist or are being followed because they will just feel natural. While it may seem constricting, the rules are actually very open ended. I will go over each of those three and how they apply to this book because I think they have a lot to do with what makes it so great. Is Ballad of a Mad girl about mental illness or not? It isn’t instantly clear and I’m not going to spoil that for you, only that the book sets the stage very well so that you are able to accept and understand what is happening thorough out the rest of the story. I’m a big fan of ghost stories and this one certainly is one even if you wanted to say it was all a delusion. There is a great deal of suspense and a great deal of mystery, the latter of which you could probably largely solve on your own if you wanted to really put the pieces together. There are twists but none without adequate foreshadowing and the hints to solve what is going on, but it’s up to you if you want to try to put them together or just enjoy the ride. It’s satisfying either way and in no way utilizes the out of left field tricks to cheapen the experience of the mystery. Characters all feel very real, with flaws and motivations all their own. The reader might have a window into more than the characters themselves, primarily in that we’re not in the same frame of mind as the characters, but this doesn’t affect what the characters know or do. The guiding principal is one that should be pretty clear to the reader early on. Ultimately this is a coming of age story and that is where every single aspect of it is rooted. Why is that important? Because it means that everything that happens in the story will fit and none of it feels like filler or added for cheap thrills. This is one of my biggest complaints about a book and many readers will eat that stuff up especially when it is a romance with a new romantic excitement. This book does not strive to give the reader any of those instant gratification pay offs, instead focusing on the long and hard earned. You the reader might find this to be not to your liking, this book is going to engage from start to finish but what it isn’t going to do is give you a quick fix. Telling the truth is very important to me. Most things that can be considered plot holes are when books are being dishonest. Does this element fit the narrative, the characters and the reality that has been established? If not, it is lying. This book doesn’t tell lies. Every bit of it goes back to the reality that was laid out for you and even fits the guiding principal. Now herein lies probably the biggest debate you could have in the book. Before I mentioned that this is a ghost story but you could insist it is all delusion. That’s ultimately not the story it is trying to tell because the book isn’t about delusion, not really, it is about growing up. This means is questions about reality or fiction will be answered because they’re not supposed to be the central point. The book could have played more with the is she or isn’t she crazy but that wouldn’t have fit. In most of my reviews I usually attempt to put a section in where I can talk about the bad of a book, but in this case that section is going to be absent. There simply wasn’t anything about this book I can really complain about. There are some matters of taste that might make an individual not want to read this book, but for me this book was entirely up my alley. A few notes, this book is a Young Adult. That’s kind of a vague thing since that category includes things like the maze running with some rather graphic acts of child murders or hunger games, so to be more specific in what I mean is that this book is rather simple in terms of light and dark. We’re only going to skirt a little bit of assault and bullying and darker themes and unhappy endings really aren’t applicable. Some dark stuff does happen and is strangely glossed over though, possibly owing onto the genre. Once again, I chalk that up to the age range, the book could of probably focused a lot on the emotional trauma of the bullying and how the characters reacted but it just doesn’t. Frankly this is the biggest criticism I could come up with and it isn’t even a good point because to focus on the bullying wouldn’t of fit the guiding principal. In other words, it would have been a different book. Does that mean the toe dipped in darker subject matter is out of place? Well not exactly, it does fit the story, but at the same time I could see the argument why it shouldn’t have been included. If it would bother you to touch but largely gloss over this aspect then you might be bothered by it. At the end of the day I found Ballad of a Mad Girl to be a near masterpiece if not complete perfection. I kind of hate giving five-star reviews because it sounds kind of cheap, or pandering, but I hope my review going into depth has helped you see that I am not doing this. There certainly is a matter of taste and for me this book fit my interest very well, but that doesn’t mean it will be universally loved. Romance novels are for instance very popular and this book is not that. If you’re hoping for high flying action then you’re also looking in the wrong place. For what this book is, the execution, the writing style and the characters I do feel this book couldn’t have done better. I would recommend this book as an essential read. I wasn't sure if I was going to like this book at first. I wasn't a huge fan of Grace at the beginning of the book because she was a bit obnoxious and self-centered. However, she gradually changed due to what she was forced to deal with over the course of the book. She came to appreciate the things that she took for granted in her life and became a stronger, more focused person. I thought that the book had a good pacing to it with everything happening at the appropriate time. The haunting happened gradually which was shown through the changes that were taking place with Grace. I enjoyed the creepy tone to the story. It wasn't overdone and the author had an interesting take on villains and heroes in the story. Things are not always what they seem in the book and the twists that are included in the book make sense due to the clues that the author weaves into the story. I may have missed it but I don't think that the author ever explained the how or why of how Grace ended up being haunted. Everything else in the book is explained really well and I appreciated the author's attention to detail.